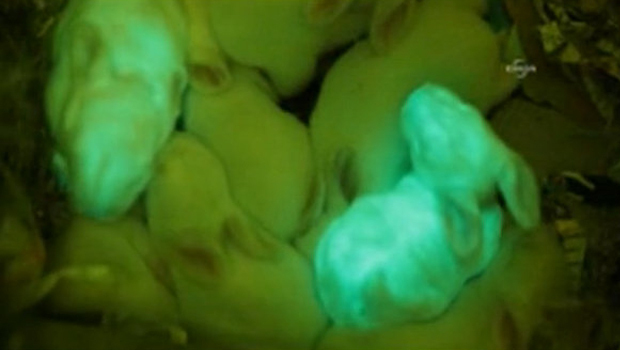 It sounds more like a child's toy, but glow-in-the-dark bunnies are now a living, breathing reality -- and researchers say they could help bring affordable drug therapies to developing countries. In a collaborative effort between the University of Hawaii at Manoa and two universities in Turkey, scientists created two transgenic (genetically modified) bunnies by inserting a gene from jellyfish DNA into a rabbit embryo. Furry and white in normal lighting, the pair glows bright green under black light. These are the first transgenic rabbits; transgenic mice, cows, goats, chickens and pigs have been successfully produced. "Because I've been around it so long, it's almost become second nature," UH Manoa's Stefan Moisyadi told CBSNews.com. "But the rabbits were sensational, they were glowing so bright that even though their fur [was thick], it was even shining right through the fur." The rabbits were conceived via in vitro fertilization (IVF). The researchers first extracted embryos from an adult female rabbit. Next, they inserted plasmids into the embryos, in a process similar to that developed for human IVF by Moisyado's mentor, Dr. Ryuzo Yanagimachi. Founder of the school's renowned Institute for Biogenesis Research, Yanagimachi famously cloned adult mice in 1998, and was an early pioneer in the development of IVF. Originally, IVF was passive, as scientists had to wait for the sperm to swim to the egg. Yanagimachi further revolutionized it by developing an active process in which the sperm is inserted directly into the egg. The method is now used in fertility clinics around the world. To transfer genes of one species into the embryos of another, Moisyadi essentially swaps the sperm from Yanagimachi's method with plasmids. The plasmids contain enzymes, or transgenes, from the jellyfish DNA as well as a tool, called a piggyBAC, that transfers the transgenes. The piggyBAC is designed to disintegrate once it's completed its role. The embryos are then injected back into the mother. The entire process takes less than half an hour, but there's no way of knowing the outcome until the mother has gone through a regular pregnancy. The fluorescent protein from the jellyfish DNA has no use aside from telling researchers if their experiment was a success. Basically, they wait until the offspring are born, then flick off the lights. If the pups glow under black light, it signals success. "It's just a marker, it has no value whatsoever," explains Mosiyado. While cool to look at, there's more to these transgenic animals than meets the eye. Now that they have proven the success of active transgenesis in rabbits, the researchers will start to use the method to inject other genes. These will be genes that produce proteins that are used in common drugs. The proteins will be present in their milk and extracted from there. The host animals don't benefit, or suffer, from the introduction of the genes. The beneficiaries are people who need access to low-cost drugs. "You can express the protein that's made from the gene and generate large quantities of it easily and cheaply. Think of a factory built under sterile conditions, it costs a heck of a lot of money. Try doing it in Uganda, countries like that. It is less expensive to purify something from the milk." The animals can, in essence, replace the costly labs and the cell culture methods through which proteins are currently engineered. They can function as "biofactories." "Once you create the animals that have a gene in them that they can't make, a bioprotein, you can breed these animals and perpetuate it," Moisyadi explains. In 2009, the Food and Drug Administration (FDA) approved the drug ATryn, created using protein from a transgenic goat, for patients with hereditary antithrombin deficiency (HD) -- a rare blood clotting disease that afflicts about 1 in 5,000 Americans. The European Union had approved the drug in 2006. GTC Biotherapeutics in Charlton, Mass. developed ATryn using protein derived from a herd of 30 transgenic goats. Scientists at AgResearch in New Zealand are using proteins derived from the milk of transgenic cows to develop drug therapies for multiple sclerosis. The cows were not fluorescent and did not glow in the dark -- that was only used to test Moisyado's method. Rather, they were created using transfection, or the introduction of DNA into a cell. The process takes about seven days in culture. Milk or meat products from transgenic animals are prohibited from entering the animal or human food supply. They are intended strictly for scientific purposes. Moisyadi continues to work on the technical aspects of the active transgenesis procedure, hoping to improve the success rate to at least 50 percent. In the rabbit experiment, the method was 25 percent successful, with the gene catching on in two of the litter's eight bunnies. Other methods pale in comparison, with rates of less than 5 percent. This rabbit experiment was actually a sideline project, while the researchers wait on the birth of the world's first transgenic sheep. Earlier this month, they injected 68 sheep embryos, and 10 have taken. But sheep gesticulate for about four months. Rabbits only take about a month. They are expecting the first of the lambs in November, but won't know if the process was a glowing success until they flick on the black light.